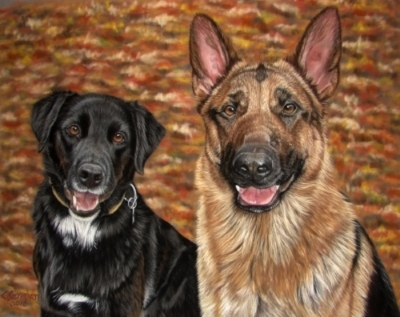 Why not show everyone how much your pet means to you by having a pastel portrait done by a professional artist. A memory that will last a lifetime! I am now taking orders for 2018. Gifts certificates are also available. Click on Facebook for newest portraits. For the newest completions and activity open links in new tabs! Please watch my video on youtube on how I paint a pastel portrait of a German Shepherd (Parts I & II). My paintings are hand drawn and painted and are not digitally produced from a photograph through software programs! I am a professional artist devoted to drawing animals. Having been painting for 35 years with pastels on velour paper, I have mastered the technique of capturing every detail of an animal, down to the last whisker. 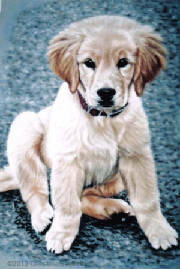 The fur looks so real, one wants to stroke it and the eyes hold your gaze. I offer many personalized ways of completing your portrait whether the ideas come from yourself or from my galleries. All I need are a few photos of your pet in order to capture the personality and characteristics that make it truly your pet. Browse through my galleries as well as my photo tips for creating a great portrait. 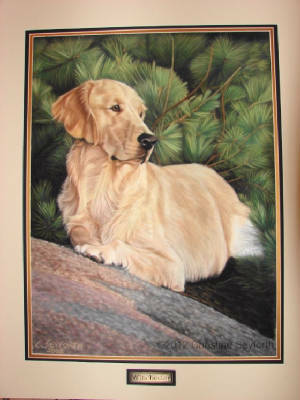 "...if you want the ultimate pastel original of your pets, here is the lady you need to speak with. I am so beside my self with the work she did with Winchester. Christine is one of the best, in my eyes ,she could almost compete with Carl Brenders and Bateman if they did pets. She is very reasonable with her prices for what you get as the final out come. The picture on her web site of Winchester is 10% of the quality of her work in real life. Check her out, you won't regret it."